Made in New England: Stonewall Kitchen Dill & Chive Crepe Mix, 16 oz. 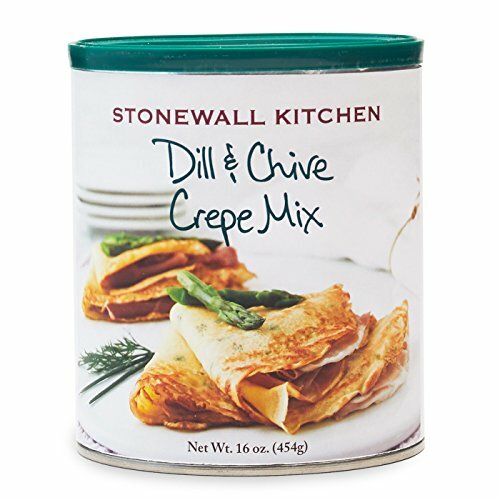 Stonewall Kitchen Dill & Chive Crepe Mix, 16 oz. While fancy French crepes may sound daunting, they are, in fact, a snap to make with this mix. The subtly herbaceous blend of dried ingredients comes together with just eggs, water and a few tablespoons of butter or oil to form a light and airy batter that cooks up in minutes. The resulting savory crepes are delicate but flavorful, the perfect vehicle for a fried egg, sautéed vegetables, dressed greens or melty cheese. Morning or night, you can prepare delicious and inventive meals that will have you saying ooh la la. Founded in 1991 by partners Jonathan King and Jim Stott, the two established themselves selling jams and jellies at local farmers' markets, fairs and festivals with their flavorful line of distinctive and high quality food items. Over time, they expanded their product line to include sauces, condiments, mustards and baking mixes. Today, products are sold in more than 6,000 wholesale accounts nationwide and internationally and through the company's 10 retail company stores and catalog and web divisions. Stonewall Kitchen is the winner of 29 prestigious awards from the Specialty Food Association and is a three time recipient of the coveted Outstanding Product Line award.